Are Europeans greener than Americans? If not, retail developments on the continent may portend big changes in U.S. food and beverage packaging. The UK supermarket chain Iceland plans to eliminate plastic packaging for the 1,400 private label products it sells in 900-plus stores by 2023, directing its 250 food and beverage suppliers to migrate to paper, cellulose, metal, glass “or new, emerging technologies,” according to Keith Hann, Iceland’s director-corporate affairs. “There will be key challenges to overall product performance, and these will be addressed as we develop new packaging solutions with our key suppliers,” he writes in an e-mail exchange. The chain’s initiative was announced a week after British Prime Minister Theresa May unveiled the ambitious environmental goal of banning avoidable plastic waste in 25 years, with food packaging a central target. The timing was coincidental, Hann assures: “Our plastic-free initiative had been in development for more than a year,” he points out, with an overwhelming majority of surveyed customers saying they favored plastic-free packaging. Iceland’s thunder rolled through the Netherlands a few weeks later when 74-store Ekoplaza unveiled a plastic-free aisle with 700 products, both perishable and shelf-stable, in its Amsterdam supermarket. Plastic-free aisles were part of May’s plea to UK grocers, along with a call for surcharges on plastic trays and other disposable plastic packaging. Ekoplaza’s plastic-free aisle includes products in a “partly bio-based and partly fossil-based” film that decomposes in 3-6 months when subjected to high humidity, oxygen and heat, according to Merva Koren, vice president-marketing with TIPA, an Israeli firm that collaborated with Germany’s Bio4Pack to produce a laminate with the strength and transparency of polypropylene and polyethylene films. Sustainability assumes composting, and that’s never a given. Ekoplaza estimates less than 9 percent of the more than 1 million plastic bottles disposed of each minute worldwide are recycled. Anywhere from 8-12 million tons of plastic waste are dumped into oceans annually. While Americans fret about microplastic particles from metal-can liners and plastic bottles, Europeans are focused on microplastics ingested by sea life that is then consumed by humans, notes Hann. 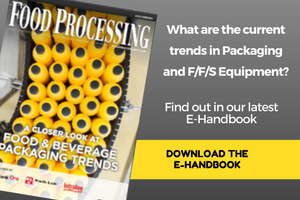 The prominence of plastic food and beverage packaging is a relatively recent phenomenon. Glass and metal provide superior barrier properties, but cost and the risk posed by fractured or broken glass drove the switch to PET and other plastics. Lightweighting containers meant many more pallets could be loaded on a truck. Category after category converted to PET in rapid succession in the early 2000s. Retailer demands trump manufacturer savings, however, and the Iceland example is generating a European bandwagon effect. The Asda chain is committed to a 10 percent cut in plastic used for store brands within 12 months. Tesco pledged to cut in half the total weight of plastic packaging used compared to a 2007 baseline. Retailers give voice to individuals’ concerns, and so far at least, U.S. retailers are mute. Whole Foods, which has stores in the UK, did not respond to our request for comment. Likewise Kroger Co., with 38 manufacturing facilities as well as almost 2,000 U.S. stores, declined to comment. In its 2017 sustainability report, Kroger touts a switch to HDPE milk containers with 10 percent less polymer. “We will save more than 5 million pounds of plastic from going to the landfill a year,” the report boasts. That leaves 45 million pounds of landfilled plastic. Iceland’s Hann counts many conversions to paper or aluminum as “easy wins” this year, along with replacing unrecyclable black plastic trays. The chain uses 100 million of those trays yearly for frozen meals. “We are in the process of reverting from plastic to pulp egg trays,” he added. Helping ignite the UK discussion of plastic packaging were remarks by Andy Clarke, former CEO of Asda (which now is a division of Walmart). Proclaiming plastic recycling programs a failure in resolving the issue, Clarke called on supermarkets to switch to paper, glass, aluminum and other materials instead. A tricky transition, but North American products will be free of bisphenol A by mid-2017.